The VELUX EHF FINAL4, the federation’s premier club handball event, is to be played in the German city of Cologne until at least 2014. The European Handball Federation has announced that the VELUX EHF FINAL4, the federation’s premier club handball event, and final round of the VELUX EHF Champions League, is to be played in the German city of Cologne until at least 2014. The new three-year agreement between the LANXESS arena, the City of Cologne and EHF Marketing GmbH will seek to build on the success of the first two events in 2010 and 2011 in Cologne, which attracted sell-out crowds from across the world. Launched in the 2009/10 season, the VELUX EHF FINAL4 has rapidly developed to become the most important and high-profile club handball event on the international sports market, attracting new major international sponsors to the sport and drawing wide-spread praise. The first VELUX EHF FINAL4 in 2010 was described by the media as the ‘best handball event for 20 years’. EHF President, Tor Lian, said: "Cologne has hosted two tremendous VELUX EHF FINAL4 events. The fact that we have attracted so many handball fans, not just from across Europe but also worldwide, underlines the fact that Cologne is the right venue for the EHF’s top club event." Commenting on the three-year deal, Michael Wiederer, EHF Secretary General, said: "I am delighted that we now have a long-term agreement to host the VELUX EHF FINAL4 in Cologne. The support we have received over the past two years from the City of Cologne and the LANXESS arena has been an important factor in creating such a successful event." Peter Vargo, Managing Director of EHF Marketing GmbH, said: "Cologne offers us the perfect venue for this flagship club event, an arena with 20,000 people, a major international city with good transport connections and also, importantly, a city with a special affinity for handball. The decision to remain in Cologne for the next three years gives us the basis to push the development of the event beyond anything that has been seen before on the indoor sports market." Jürgen Roters, Lord Mayor of Cologne, said: "This is great news for the sports city of Cologne and will further strengthen our reputation as a leading venue for the hosting of major international sporting events. The biggest winners are Europe’s handball fans, who will enjoy three more years of world-class handball in the heart of Europe. For the City of Cologne, through the Department of Sport, the Management of the LANXESS arena and the Stadionwelt agency, this decision will serve as further motivation to continue to develop this highly attractive international sports event." Stefan Löcher, Managing Director of the LANXESS arena, said: "The European Handball Federation’s announcement that it is to organise the VELUX EHF FINAL4 in the LANXESS arena for the next three years is a great honour. The decision underlines Cologne as the ideal venue for major sports events. With this long term decision the European Handball Federation has made the LANXESS arena into the Mecca of European handball." The VELUX EHF Champions League is the premier men’s club handball competition in Europe. The continent’s top 24 men’s professional handball clubs compete initially in four groups of six teams, and play from September to May for a chance to be one of the four teams to qualify for the final stage of the competition, the VELUX EHF FINAL4. More information and the latest news available at ehfCL.com. 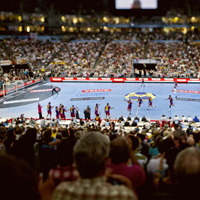 The VELUX EHF FINAL4 was introduced in the 2009/10 season to critical acclaim, the media describing the first event as the ‘best handball event for 20 years’. 19,750 spectators watched the final in 2011, setting a new record in European club competitions. The 2011/12 event will be played on 26 and 27 May 2012 in the LANXESS arena, Cologne, Germany. Tickets for the VELUX EHF FINAL4 can be purchased via the online shop at ehfFINAL4.com and direct through the ticket hotline +49 211 280 288.